1 small butternut squash, peeled, seeded, cut in half and sliced in 1/2 inch thick slices. Reserve seeds. 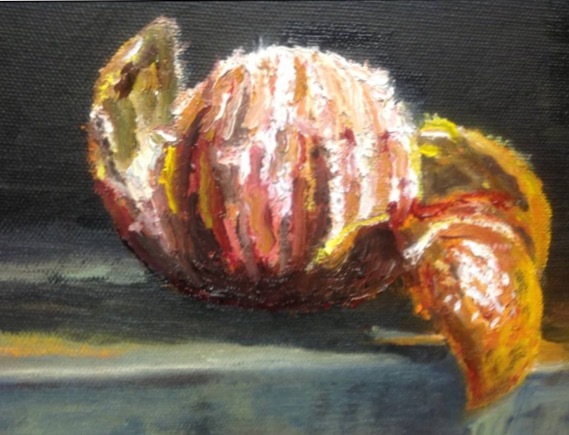 1 fennel bulb, sliced in 1/4 inch thick slices, white part only. Reserve fronds. I tossed the vegetables in about 4 tablespoons of olive oil. I sprinkled them with 1 teaspoon sea salt, 1 tablespoon chili powder, 1 teaspoon cumin and 1 teaspoon fennel seeds. Try any spice combo but think about adding some heat to contrast with the sweetness and acid of the oranges. Roast all the veggies at 425 F for 20 minutes, stirring half way through to prevent burning. On another baking sheet I spread the reserved squash seeds tossed with olive oil and a few grinds of sea salt and roasted those about 5 minutes. (You will hear them pop like popcorn when they are ready). Watch closely so they don’t burn. To read more detailed instructions on roasting squash seeds please visit this post. Once you have tasted roasted squash seeds, you will never be able to throw them away, they are so good! Cool the veggies and seeds for 10 minutes. While the vegetables are roasting, prepare 4 blood oranges: Slice off top and bottom and stand on a cutting board. With a sharp knife, cut along fruit’s curve and remove both the pith and peel. Slice the oranges cross wise, reserving any escaping juice. If using grapefruit instead of oranges, use 2 instead of 4 and segment them from their tougher membranes. I didn’t fuss with segmenting the oranges, wanting to keep them in whole slices. On a serving platter spread the roasted vegetables. Top with the sliced oranges and drizzle the reserved juice across the salad. 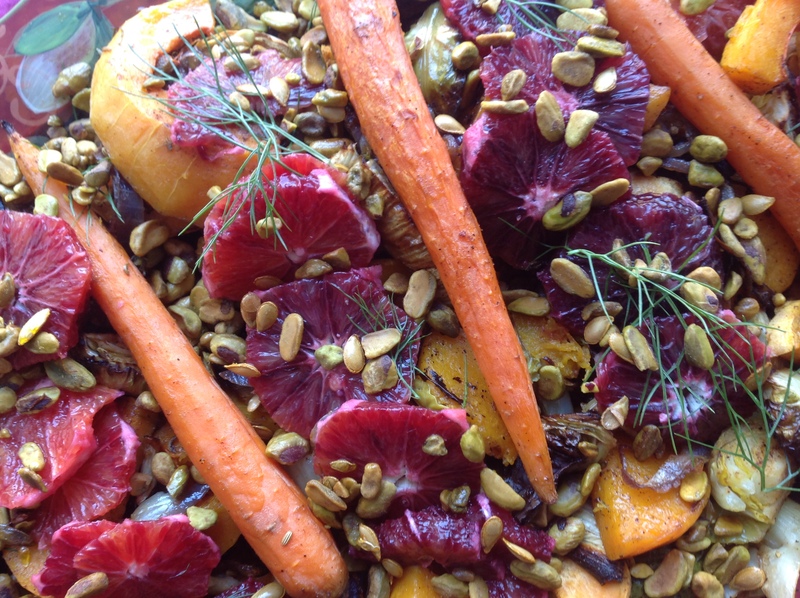 Sprinkle with fennel fronds, the toasted squash seeds and 1 cup roasted pistachios. Serve at room temperature. 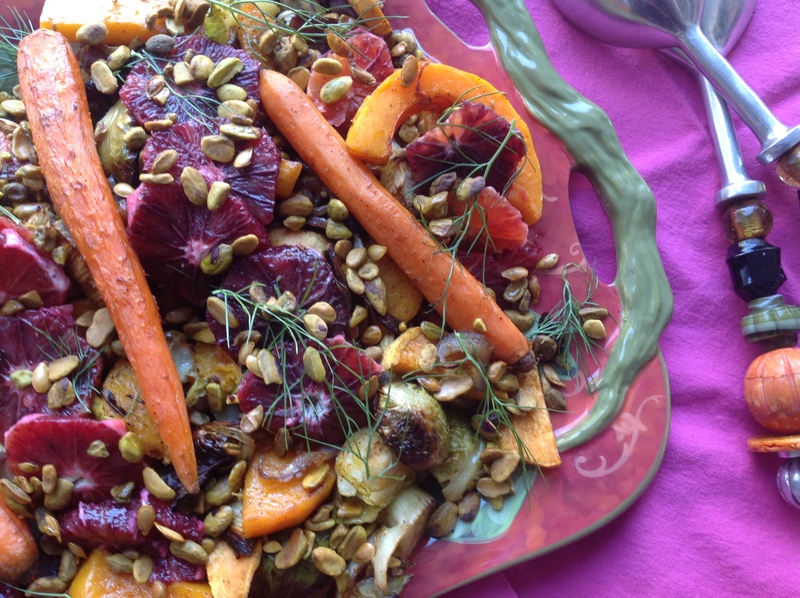 Here’s hoping this colorful, nutrient-dense salad, full of bold flavors and with a satisfying crunch will keep you healthy and happy through winter! 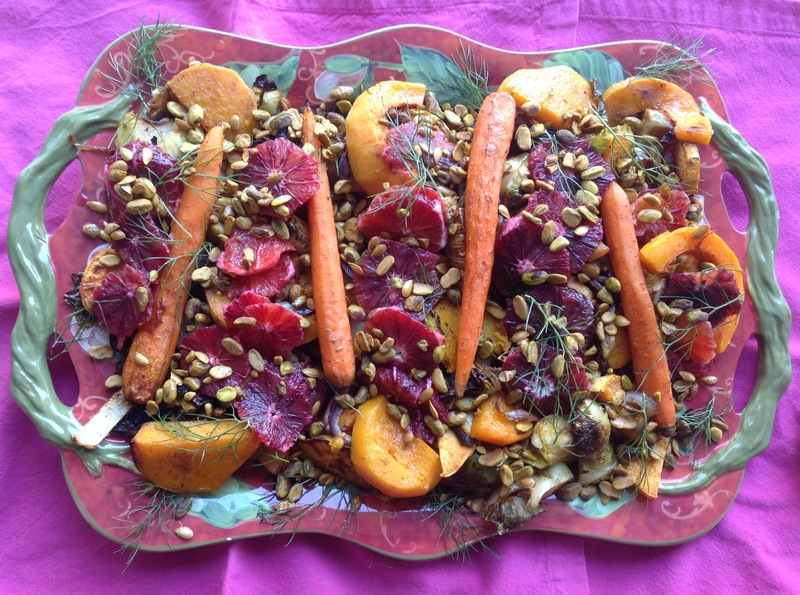 This entry was posted in Recipes and tagged roasted fennel and squash salad, roasted squash salad with blood oranges, roasted squash seeds, roasted vegetables with citrus and pistachios, Roasted winter vegetable salad by Johanne Lamarche. Bookmark the permalink.